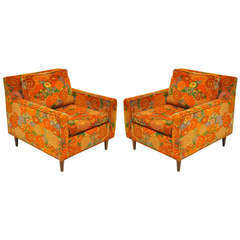 Pair of Curvaceous tub chairs by Harvey Probber, American, circa 1960s. These chairs are currently being restored and can be completed in your fabric. 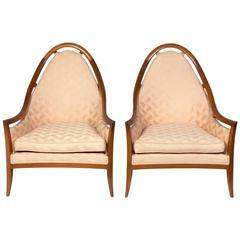 The price noted below includes reupholstery in your fabric and the frames being polished and lacquered. Very good condition. These chairs are currently being restored and can be completed in your fabric. 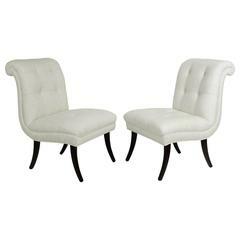 The price noted below INCLUDES reupholstery in your fabric and the frames being polished and lacquered. 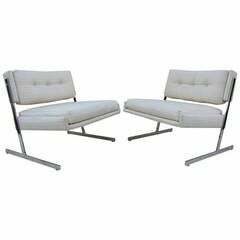 Pair of curvaceous modern lounge chairs, designed by Harvey Probber, circa 1960s. 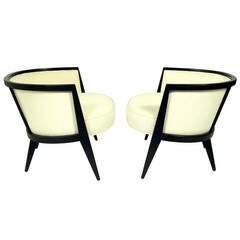 They have been completely restored in an ivory color bouclé fabric and an ultra deep brown lacquer. A rarely seen pair of lounge chairs. Comfortable and stylish. 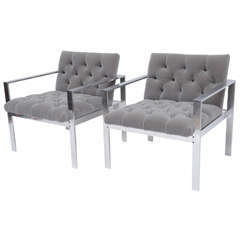 Dynamic pair of Harvey Probber chrome lounge slipper chairs. Extremely comfortable, prefect sitting position. In very good condition. 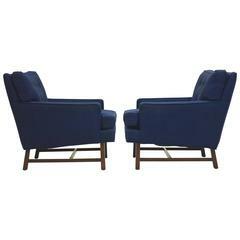 A pair of club chairs by Harvey Probber. Chairs are upholstered in fabulous vintage velvet fabric.